Today I have with me Chris Craft, CVO (Chief Visionary Officer) of Nao Media and Consulting, a digital marketing and design agency based out of Atlanta, Georgia and author of the forthcoming book, O.P.E.N. 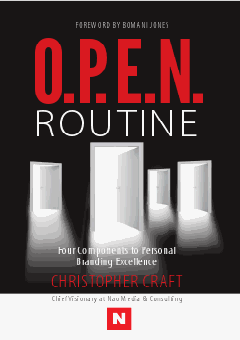 Routine: Four Components to Personal Branding Excellence. It’s a book Chris is uniquely qualified to write, since he and his team specialize in the personal branding and social media representation that form the cornerstone of theO.P.E.N. Routine. I’ve worked with him some in the past and have always been impressed with the depth of his knowledge and his passion for what he does. He’s been kind enough to take some time out of his busy schedule to answer a few questions about his book and the personal branding credo he lives by. Hi Chris, thanks so much for speaking with me. How’s life treating you? CC: Hi Jon, thanks for giving me some light on your stage. I really appreciate it. Life is like a box of Cracker Jacks. The prize inside is often a mystery my friend. I’m keeping quite busy though. And now that we have all the warm fuzzies out of the way, let’s dive into these questions. Q1) Tell the good folks at home a little bit about yourself and your book. CC: I’m a proud Texan, husband, and father in the order of accomplishment. Yes, being a Texan is an accomplishment! I’m also a lover of business, books, and business books incidentally. I also love people and networking. All that mixed together leads to the reason of me writing my first book, O.P.E.N. Routine. In brief, the book is about my story as a person and entrepreneur. My goal is for the reader to embrace that they have a brand and story that matters. 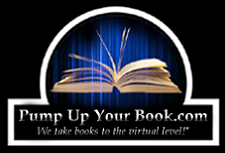 From there, the book is written with action in mind. I describe how to seize opportunities, find and follow your passion, leverage education, and network so you can reach personal branding excellence. Q2) Why did you decide to write O.P.E.N. Routine—I mean, other than the chance for fame and fortune beyond your wildest dreams? CC: Honestly, it was a challenge and quite therapeutic. I mention in the book that it’s a personal manifesto. I’m open about my history in the book, but I know my future also hinges on my practicing of what I preach. I’m not looking to get rich off the book itself. It’s the content inside of the book that’s of real value. Q3) So, what exactly is personal branding? And at the beginning of your book, you say that it is a “personal manifesto.” How so? CC: Personal branding is everything. It’s how your hair looks leaving the house. It’s how you treat the bagger at the grocery story. It’s how you handle wins. It’s how you handle adversity. It’s a mashup of how you present yourself, impose your will, react, influence, and promote your presence. It’s how other people perceive you. I answered the second question in the previous answer. Q4) Personal branding makes a lot of sense for celebrities, high-climbing business people, and other folks out there basking in the limelight. But what about your average lay-person? How do the principles of personal branding apply to them? CC: The only difference between a celebrity and a your “average” lay person is that the celebrity works or presents their work in front of more eyeballs. Everyone (save hermits) have public human interactions on a daily basis. The point is to be cognizant of how your acts and decisions in public and private determine how others perceive you. Q5) One interesting thing I noticed in your book is that there are several sections that call for readers to engage with you personally—sending you e-mails, hitting you up on Twitter, etc. Number one, do you really answer all of those emails? And number two, what spurred your desire to connect with your readers on this level? CC: Oh yes. I definitely answer all the emails and tweets personally. I’m big on engagement. As I mentioned earlier, my passion is the fourth component of the O.P.E.N. Routine – networking. My brand is rooted in how I engage with my readers. 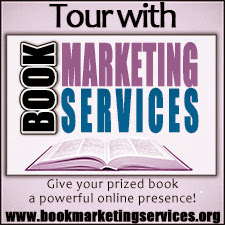 My desire to connect with my readers comes from wanting to build strong relationships and promote increase in every interaction I have. My music industry experience has a lot to do with this. Music is a very personal and engaging medium. Q6) The first tenant of your O.P.E.N Routine is Opportunity. In the book you talk a lot about the random nature of opportunity. But is there any way for the folks out there to better position themselves to take advantage of that random opportunity—or indeed, to increase the frequency that opportunity knocks on the door? CC: It’s a volume game; so the answer lies in the fourth component, networking. If you don’t get outside of the four walls of your business or home, then you won’t increase your frequency of attempts as far as seizing opportunities. I don’t even like to think of opportunity as knocking because that often puts people in a passive mind state. You have to be active. You can’t leave things up to chance. Q7) The next tenet is Passion, and I totally get where you’re going with that. You have to be passionate about a business if you’re going to devote the energy to make it succeed. But what about people like, I dunno, yours truly, whose passion (reading books and pontificating about them like a wannabe college professor) ain’t all that lucrative? How can we harness that passion for our personal brands and success? CC: To be clear, success and excellence in some passions don’t always lead to great financial gain. In fact, being rich is a very personal feeling or status. You have to define what success means to you. If you’re doing what feels right to you on a regular basis, then you’re harnessing your passion. My advice is for people to start with the end in mind. Know where you want to end up. Whether you hit your goal, go beyond it, or fall short, just go for it as hard as you can. If there’s another level of success that you want to reach but you’re struggling getting there, you might have to break out of your comfort zone to reach that point. Q8) Then there’s Education. A great point you make is that education doesn’t only happen in the classroom. Can you elaborate on that for everyone else? CC: Education or learning happens in almost every event in our lives. It’s our job to pull the jewel out of these events. Many people try to fully depend on their college education in their careers. The problem with that strategy is that you might run the risk of not being well rounded or mature enough for what you want to accomplish. Also, learning should be used to support your passion. You should seek knowledge inside and outside the classroom that’ll help you attain success in your passion. Q9) And finally there’s Networking, the final letter in the acronym soup that brought the two of us together. What’s the most important thing about networking you want your readers to understand? CC: I want my readers to know that old school networking still matters! Looking people in the eyes when speaking to them, listening well, and having a confident handshake still matters! We can’t always hide behind our social media avatars. At some point you’re going to have to be a rock star in person. Q10) In closing, are there any final thoughts you’d like to leave your readers list? Any kernels of wisdom you can bestow upon them before you kick them out the door of the airplane and into the wide blue yonder? CC: Smile in the face of adversity… no matter how hard it is to do. Triumphing over adversity and turmoil makes for a great story. Couldn’t have said it better myself, sir. And that about does it. Thanks again for taking my questions, and thanks for sharing your manifesto with the world. CC: Thanks for the support my friend. If you’d like to purchase a copy of the O.P.E.N. Routine, head on over to http://openroutine.com. 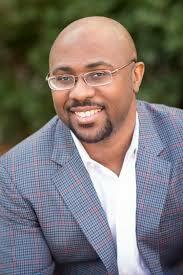 And for more about Chris and his company, Nao Media and Consulting, visit http://naoisnow.com. The Giveaway - Chris is giving away a signed copy his book, O.P.E.N. Routine. Sign up using the Rafflecopter widget below. You all know the drill, right?